You may have gathered that I am rather enthusiastic about Bible reading. I talk about it quite a bit on this blog and as it happens, I talk about it quite a lot in real life too. And then I get to hear lots of reasons why people don't read the Bible. I'm not a reader. I don't read anything much. I meet with three small groups of women during the week and together we study the Bible. Until this year, two groups did Bible studies and the third was a Bible reading group. I made the third one a Bible reading group because most of its members had small children who tagged along and with small children rattling around the place, I thought it would be too difficult to attempt a Bible study. Besides, most of the group didn't have a background in regular Bible reading. And the phrase "Bible study" sounded too scary. Most are usually happy to talk about something that stood out. Sometimes we tackle something we didn't get. Lots of the time we just leave the things we didn't get - and that's OK. It's not that I want to promote a form of laziness in Bible reading. Trying to nut out the hard stuff is important. But read on...I'll get back to this. If there is time, energy and the children are playing well, we do another chapter. Sometimes we get through three chapters. Mostly it's one or two. The discussion eventually finds its way to some points of personal application and then I close with a short prayer. Last week I picked up One to One Bible Reading by David Helm. WHAT A GREAT BOOK. It's all about how to read the Bible with someone else on a regular basis for a mutually fixed amount of time, just as my Bible reading group has been doing for a while. the question of whether or not to prepare before meeting together. Helm then provides two different frameworks for reading - a simple approach called The Swedish Method which runs a bit along the lines of my two question technique (it adds the third question of personal application up front, whereas I tend to let the application gradually drift out in discussion or through my wrapping up prayer) and a slightly more detailed approach (the COMA method - Context, Observation, Meaning, Application). The final part of the book is a resource section with an excellent overview of the different types of books in the Bible and some ways to get into the different genres, including some photocopiable sheets of COMA questions for each of the genres. One of the things I really love about this book is that it is short and concise. I read it in an hour. Now I am thorougly convinced of the benefits of one-to-one Bible reading so what I was reading was all very familiar, but if this idea is new to you and you need some pondering time as you read, I imagine you could still knock it over in a couple of hours. It gets straight to the point, it's eminently practical and it demonstrates the benefits and joys of tackling some one to one Bible reading. It is the perfect handbook on this subject. Feeling worried even so? Don't think you know your Bible well enough to take this on? One of the things I really love about one to one Bible reading is that yes, the Bible is hard in parts - but we need not be scared of it. As I said earlier, we often don't tackle the bits we didn't understand with my little lunchtime group . A recent, glorious example of this was when we read through Joel a few weeks ago. Three chapters. I departed from my usual method of one chapter at a time and we read all three chapters at a run. Then I asked my two usual questions and for once everyone was happy to answer the second question - "What didn't you get?" - and everyone pretty much said they didn't get any of it! One brave soul then ventured to say that there were a couple of verses that stood out, that made her heart sing, in the midst of a whole lot of incomprehensible text. It was a couple of verses about hope. So we looked at those verses and had a good discussion about hope in Joel and then in ever widening Biblical contexts. Because that is what Bible reading is like. We don't get it all on the first sweep. And we do get to read it over and over, time and time again. And each time we will get it a little more than before, as what we understand starts to inform what we don't understand in ever widening circles. Come back to my lunchtime group. In the time since we started reading together, all thanks to God, some have put their faith firmly in Jesus and others have started tackling reading the Bible on their own. They don't understand all of what they are reading, but they are no longer scared to have a go. They are making it a part of their daily routine and have launched into the lifelong, wondrous pursuit of Bible reading. Nutting out the hard stuff (that would be "Bible study") will come later, as a natural progression. I have seen all the reasons so often given for not reading the Bible dissolve away with this group, all because we have sat down once a week during school term time over two or three years and simply read the Bible together. And for this reason I made some changes this year. I now have two Bible reading groups and one study group. 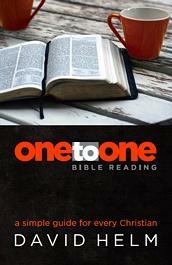 Click here to order a copy of One to One Bible Reading (or here for the eBook version). It is easy to read and it may just encourage you to get yourself caught up in that beautiful, chaotic web of personal relationships, Bible reading and prayer. Go for it. Be encouraged. It is a rich blessing. 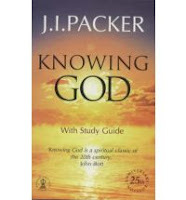 Put up your hand if you have read Knowing God by JI Packer. I know lots of people who have started it but haven't make it all the way through. And many others who didn't ever get started. Which seems to defy logic given that this book has found its way onto most top ten lists of good reads for Christians. I've made a start on it several times in the past but didn't ever get very far. I started it again last October and finished it just last week. It's definitely a book that needs to be read slowly. And savoured. I read it a chapter here and a chapter there over the six months that it sat on my bedside table. It's not to be read for the sake of ticking it off the top ten list. Nor is it good to read if in pride you think you already know it all. If you go into this book just wanting to turn the pages and check off "yes, I know that" on your list of knowledge about God or wanting to check off the book title from your top ten list of books then you probably won't make it. Because this is not an especially easy book to read. JI Packer writes clearly, cleanly and beautifully. He explains difficult theological concepts with amazing clarity. And there are a few quips and asides to enjoy along the way. But Packer writes with such economy of language that you cannot skim over paragraphs or skip over pages. Every word on every page counts. But if you find yourself in a space where you really want to know God better - to deepen your personal resources on how to love God with all your heart, soul, mind and strength and to be truly amazed by His amazingly gracious and merciful love for you - then this is a rich book. I especially enjoyed chapters eight (The Majesty of God) and nine (God Only Wise). And in the final chapter (The Adequacy of God) Packer did a quick sweep over Romans 1 to 7 and then spent several wonderful pages plumbing the depths of Romans 8 - which was glorious. This book clearly has its place on the top ten lists. Keep it on your top ten list. But keep it for a time when you have the time, patience and perserverence to take it slowly. For a time when you are truly hungry to know God better. And then read it and grow. and asking God to fill you with the knowledge of his will through all spiritual wisdom and understanding. Sometimes when praying, especially with prayers said repeatedly over the long haul, it can be easy to wonder, "Why isn't God answering this prayer?" Here's a wonderful quote from Knowing God by JI Packer about looking for the ways in which God may in fact be answering such prayers. Not, indeed, that our Father in heaven always answers his children's prayers in the form in which we offer them. Sometimes we ask for the wrong thing! It is God's prerogative to give good things, things we have need of, and if in our unwisdom we ask for things that do not come under these headings God, like any good parent, reserves the right to say, "No, not that; it wouldn't good for you - but have this instead." Good parents never simply ignore what their children are saying, nor simply disregard their feelings of need, and neither does God; but often he gives us what we should have asked for, rather than what we actually requested. Paul asked the Lord Jesus graciously to remove his thorn in the flesh, and the Lord replied by graciously leaving it and strengthening Paul to live with it (2Corinthians 12:7 ff.) The Lord knew best! - and to suggest that because Paul's prayer was answered this way it was not answered at all would be utterly wrong. Here is a source of much light on what is sometimes called "the problem of unanswered prayer." From Knowing God by JI Packer chapter nineteen, page 239. Emphasis mine. So what REALLY happened in the run up to Easter 2012? we didn't manage much at all really in the lead up to Easter. and in another sense, life just got away from us. It's all sounding a bit like last year. that will be brilliant to use in and out of season. The truth of Easter is timeless. Because that passed me by this year as well. Do you remember the weeds? 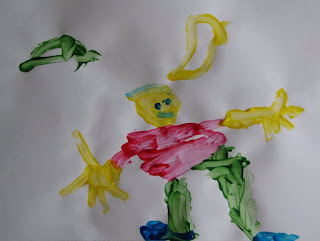 I'm no Super Mummy Blogger. But I am intending Easter to be meaningful and full of joy even so. And I hope yours is too. The post Making the transition from children's ministry to church, on the topic of seeing children make the transition into church and into a faith of their own, included a blend of notes I'd taken at a recent children's ministry conference and some personal thoughts. The "take home" message from the workshop and the post that followed was that credible relationships between adults and children in church seems to be important. But there's more! Because being in church and staying in church is not just about relationships with others. Jon Nielson is a youth pastor. In his post Why youth stay in church when they grow up at The Gospel Coalition (HT: the lovely Jean) he considered the drift from church by teenagers and young adults and then made three observations of those in their 20's from his church who are thriving, flourishing Christians. What seemed to make the difference? Nielson said, "We need to stop talking about 'good kids.' We need to stop being pleased with attendance at youth group and fun retreats. We need to start getting on our knees and praying that the Holy Spirit will do miraculous saving work in the hearts of our students as the Word of God speaks to them...We need to preach, teach, and talk—all the while praying fervently for the miraculous work of regeneration to occur in the hearts and souls of our students." Nielson said, "The common thread that binds together almost every ministry-minded 20-something that I know is abundantly clear: a home where the gospel was not peripheral but absolutely central." Which reminds me of this quote, "You must never succumb to the thinking that this is the responsibility of the youth group and Sunday school. True conversion of the heart and soul of your children is your God-given charge," from Disciplines of a Godly Family by Barbara Hughes. This is a very difficult subject to write about because it pulls right at the heart of the grace vs works tension. It raises guilt. Or prompts laziness. Ultimately whether a child makes the transition from vicarious faith to a flourishing owned faith rests in God's hands. And yet, in His grace, God allows us to participate in the process of bringing our children to a saving knowledge of Him. All rests in God's hands. But these are some good things to guide us as we pick up our part that He has given us to play. It is a long term work. And it rests in prayerful dependence upon our gracious God.